as well as two other articles,Guatemalans Resist Invasion of North American Mines and The Wars Come Home: Police Militarization in the United States of America. 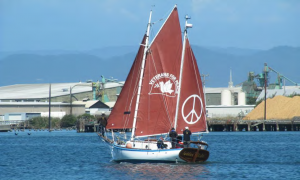 After joining the Veterans For Peace Golden Rule Project, she was chosen for crew of the maiden voyage of the newly rebuilt sailboat and sailed the entire voyage from Humboldt Bay to San Diego and back during 2015. She is now the Project Manager, part time crew, shore support, newsletter editor and public speaker on behalf of the Golden Rule. She is honored and humbled by the opportunity to help the cause of ending the possibility of nuclear war through the VFP Golden Rule Project and the VFP Nuclear Disarmament Committee. She is also a member of the Women’s International League for Peace and Freedom and part of the leadership team of the WILPF Disarm/End Wars Committee. Samantha Ferguson is the Event and Program Coordinator for Veterans For Peace. She works out of the national office in Saint Louis, Missouri and devotes half of her time to the Golden Rule Project and half to the Veterans For Peace Challenge Islamophobia campaign.